How about some commemorative TFFFY postcards to mark TMM's first five formative years? Don't look now children,but did anyone notice how 'quiet' it became after the debt auctions got off at the beginning of this week? Did the debt market players get what they wanted and go away for another month? Is it safe to come out and play in Ben Bernanke land again? I am struck by the monthly cyclical nature of the markets and it's playground like behaviour. All you growth/risk players go to your classrooms immediately whilst the debt market get's to play with the ball. Followed by the ..stop! you've had your turn at the debt auction trough now be off back to the classroom and let the growth mob know they can come back out and 'expiry' in the playground with Uncle ben. DAX up 3% in a mini melt-up. Do I detect the aroma of barbecued bear? Perhaps a slow cooker. LB will be ready to baste the beast. Our Friday punt from the long side is looking better. DAX 5500 and SPX 1200 are the targets for now? Euro bonds? Blue and red bonds? Euro Bond Two Tier System? 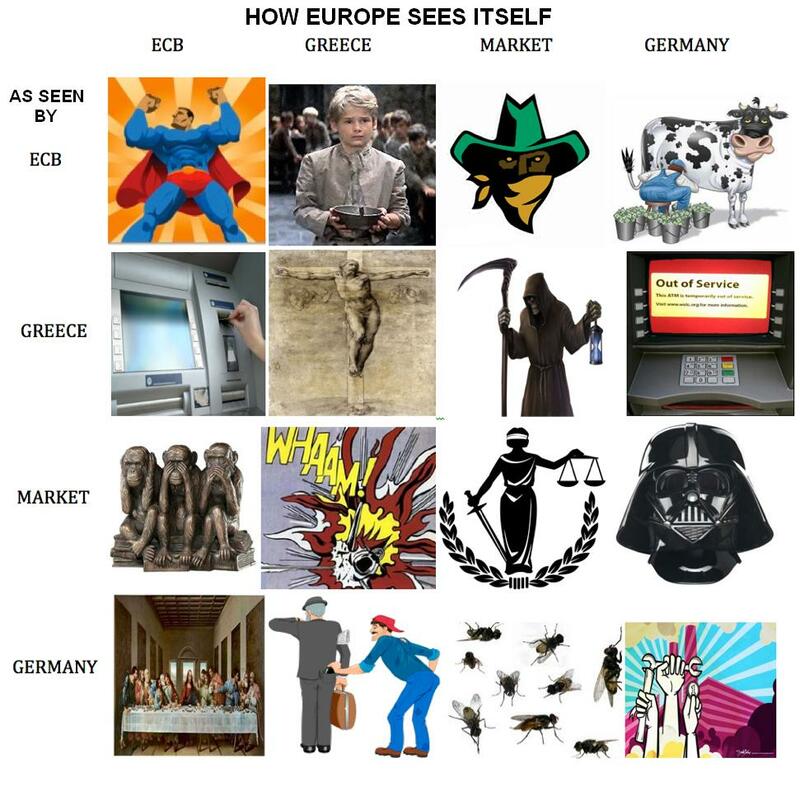 ECB, is that a bazooka in your pocket or are you just happy to see me? I don't mean to be a party pooper, but wasn't a 'permanent' solution such as a eurobond or the ESM effectively ruled out by the German Constitutional Court last week? Hardly a bearish close in Frankfurt. Permanent solutions may be a long way away, but there is no shortage of cans waiting to be kicked, starting with Mr Shorty's can, which appears over-exposed to a potential unscheduled invasion by the proctologist in the near future. I apprecaiate the willingness to be bullish,but it really depends on your timefame here. After a significant selloff there is obvious cause to for the shortside to ease and wait for a market to fill gaps and correct sentiment. However, the underlying economic macro still is what it is which as it stands not very expansive. I am also sure that because memories are what they are there is a goodly portion of players out there waiting for Big Ben to strike next week so would you want to reset short signifcantly BEFORE that? To me we are in that void place that often comes after big moves ,but my take is that this is still a market that is concerned with cashing up overall notwithstanding that ther usual short term players who are always in the market can thrash it around a few % flipping it backwards and forwards between themselves with zero meaning for macro.. Always happy to thrash it around for a few % in a trading range, me old china, that's called alpha. A touch of Cold Steel™ into the close for shorties. Is this another JSTFR moment or is the Eurofudge™ factory so busy that we will see TCKDTR*? *TCKDTR = the can kicked down the road. I remarked the other day we have priced in a systemic sized event now that better arrive because if it doesn't we have grossly mispriced an whole array of stuff. That brings me to our friend the CTD,because at nearly 100%,this to me just means 'we are nearly all thinking the same thing' and what I usually know about markets is when most people are thinking the same thing they tend to be wrong which is why markets tend to mean revert so much because gains are more, or less always given back to a great extent by that behavioural nuance. So here is my great call for posterity. You and I don't yet know it ,but the Global movers and pushers are going to decide collectively to put a net under this potentially hhuge destructive event simply because it is in all of their mutual inetrest to do so. I dn't know exactly what form of 'rescue' it will take only that I think that is an higher probability to happen than the alternative. Anyone want to buy some banks..going cheap! I haven't laughed so much in years,!! !